The transfer of electrons between molecules via oxidation and reduction allows the cell to transfer and use energy for cellular functions. When electrons are added to a compound, the compound is reduced; a compound that reduces another is called a reducing agent. When electrons are removed from a compound, the compound is considered oxidized; a compound that oxidizes another is called an oxidizing agent. The transfer of energy in the form of electrons allows the cell to transfer and use energy in an incremental fashion. The principle electron carriers are NAD+ and NADH because they can be easily oxidized and reduced, respectively. NAD+ is the oxidized form of the niacin and NADH is the reduced form after it has accepted two electrons and a proton. oxidation: A reaction in which the atoms of an element lose electrons and the valence of the element increases. nicotinamide adenine dinucleotide: (NAD) An organic coenzyme involved in biological oxidation and reduction reactions. The removal of an electron from a molecule via a process called oxidation results in a decrease in the potential energy stored in the oxidized compound. When oxidation occurs in the cell, the electron (sometimes as part of a hydrogen atom) does not remain un-bonded in the cytoplasm. Instead, the electron shifts to a second compound, reducing the second compound (oxidation of one species always occurs in tandem with reduction of another). The shift of an electron from one compound to another removes some potential energy from the first compound (the oxidized compound) and increases the potential energy of the second compound (the reduced compound). The transfer of electrons between molecules via oxidation and reduction is important because most of the energy stored in atoms is in the form of high-energy electrons; it is this energy that is used to fuel cellular functions. The transfer of energy in the form of electrons allows the cell to transfer and use energy in an incremental fashion: in small packages rather than as a single, destructive burst. In living systems, a small class of molecules functions as electron shuttles: they bind and carry high-energy electrons between compounds in cellular pathways. The principal electron carriers we will consider are derived from the vitamin B group, which are derivatives of nucleotides. These compounds can be easily reduced (that is, they accept electrons) or oxidized (they lose electrons). Nicotinamide adenine dinucleotide (NAD) is derived from vitamin B3, niacin. NAD+ is the oxidized form of niacin; NADH is the reduced form after it has accepted two electrons and a proton (which together are the equivalent of a hydrogen atom with an extra electron). It is noteworthy that NAD+must accept two electrons at once; it cannot serve as a one-electron carrier. 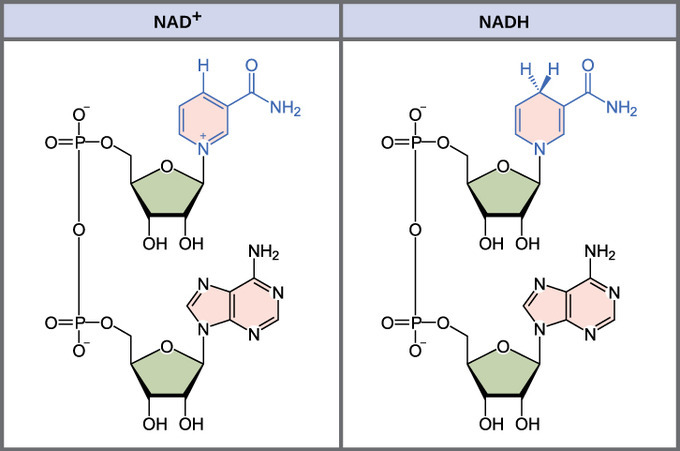 The structure of NADH and NAD+: The oxidized form of the electron carrier (NAD+) is shown on the left and the reduced form (NADH) is shown on the right. The nitrogenous base in NADH has one more hydrogen ion and two more electrons than in NAD+. When electrons are added to a compound, the compound is reduced. A compound that reduces another is called a reducing agent. In the above equation, RH is a reducing agent and NAD+ is reduced to NADH. When electrons are removed from a compound, the compound is oxidized. In the above equation, NAD+ is an oxidizing agent and RH is oxidized to R. The molecule NADH is critical for cellular respiration and other metabolic pathways. ATP, produced by glucose catabolized during cellular respiration, serves as the universal energy currency for all living organisms. Compare the two methods by which cells utilize ATP for energy. Cells require a constant supply of energy to survive, but cannot store this energy as free energy as this would result in elevated temperatures and would destroy the cell. Cells store energy in the form of adenosine triphosphate, or ATP. Energy is released when the terminal phosphate group is removed from ATP. To utilize the energy stored as ATP, cells either couple ATP hydrolysis to an energetically unfavorable reaction to allow it to proceed or transfer one of the phosphate groups from ATP to a protein substrate, causing it to change conformations and hence energetic preference. A living cell cannot store significant amounts of free energy. Excess free energy would result in an increase of heat in the cell, which would lead to excessive thermal motion that could damage and then destroy the cell. Rather, a cell must be able to handle that energy in a way that enables the cell to store energy safely and release it for use as needed. Living cells accomplish this by using the compound adenosine triphosphate (ATP). ATP is often called the “energy currency” of the cell and can be used to fill any energy need of the cell. Adenosine triphosphate. : ATP (adenosine triphosphate) has three phosphate groups that can be removed by hydrolysis to form ADP (adenosine diphosphate) or AMP (adenosine monophosphate).The negative charges on the phosphate group naturally repel each other, requiring energy to bond them together and releasing energy when these bonds are broken. The core of ATP is a molecule of adenosine monophosphate (AMP), which is composed of an adenine molecule bonded to a ribose molecule and to a single phosphate group. Ribose is a five-carbon sugar found in RNA, and AMP is one of the nucleotides in RNA. The addition of a second phosphate group to this core molecule results in the formation of adenosine diphosphate (ADP); the addition of a third phosphate group forms adenosine triphosphate (ATP). The addition of a phosphate group to a molecule requires energy. Phosphate groups are negatively charged and, thus, repel one another when they are arranged in a series, as they are in ADP and ATP. This repulsion makes the ADP and ATP molecules inherently unstable. The release of one or two phosphate groups from ATP, a process called dephosphorylation, releases energy. Hydrolysis is the process of breaking complex macromolecules apart. During hydrolysis, water is split, or lysed, and the resulting hydrogen atom (H+) and a hydroxyl group (OH–) are added to the larger molecule. The hydrolysis of ATP produces ADP, together with an inorganic phosphate ion (Pi), and the release of free energy. To carry out life processes, ATP is continuously broken down into ADP, and, like a rechargeable battery, ADP is continuously regenerated into ATP by the reattachment of a third phosphate group. Water, which was broken down into its hydrogen atom and hydroxyl group during ATP hydrolysis, is regenerated when a third phosphate is added to the ADP molecule, reforming ATP. Obviously, energy must be infused into the system to regenerate ATP. In nearly every living thing on earth, the energy comes from the metabolism of glucose. In this way, ATP is a direct link between the limited set of exergonic pathways of glucose catabolism and the multitude of endergonic pathways that power living cells. When ATP is broken down by the removal of its terminal phosphate group, energy is released and can be used to do work by the cell. 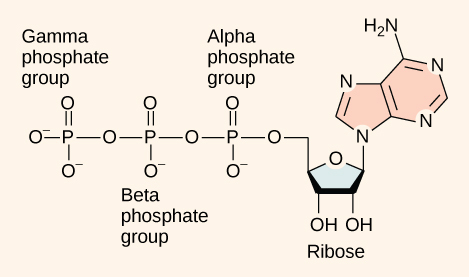 Often the released phosphate is directly transferred to another molecule, such as a protein, activating it. For example, ATP supplies the energy to move the contractile muscle proteins during the mechanical work of muscle contraction. Recall the active transport work of the sodium-potassium pump in cell membranes. Phosphorylation by ATP alters the structure of the integral protein that functions as the pump, changing its affinity for sodium and potassium. In this way, the cell performs work, using energy from ATP to pump ions against their electrochemical gradients. Sometimes phosphorylation of an enzyme leads to its inhibition. For example, the pyruvate dehydrogenase (PDH) complex could be phosphorylated by pyruvate dehydrogenase kinase (PDHK). This reaction leads to inhibition of PDH and its inability to convert pyruvate into acetyl-CoA. Protein phosphorylation: In phosphorylation reactions, the gamma phosphate of ATP is attached to a protein.